And to think I actually paid good money for this book! I only read the first few chapters and frankly it made me scream and throw it into the corner. Is it really worth perservering with? Can I skip some chapters and still get something from it? 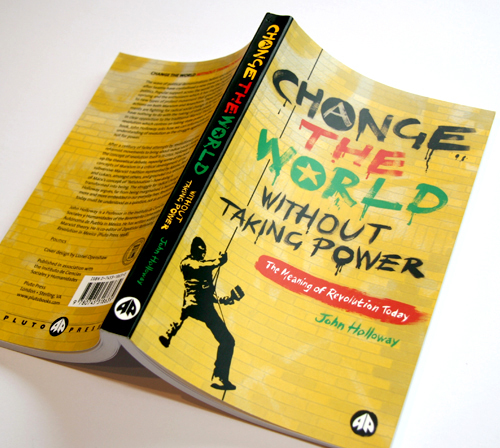 Is John Holloway anything more than a jumped up academic Marx revisionist? I need some convincing to give it another go. The title alone reminds me of the work of Antonio Gramsci - thank you for making it available. I know that the language that Holloway uses can be polarising, but I think he actually is really worth the read. The core of his project, to place understandings of fetishisation at the centre of the critique of capitalism and then to derive a broader theory of society from this - in a way that emphasises struggle and possibility rather than closure and despair is great. Crack Capitalism is a superior book ( he moves from understanding fetishism as the opposition of subject and object to that of concrete labour and abstract labour) but "Change the World..." is worth reading. His older work around the state derivation debate is also top banana, in many ways you can see his current writings as an extension of this debate to derive an understanding of identity, time, sexuality etc as arising from and constituting the world that allows the fetishisation of creativity into the commodity-form. Awesome, but could seriously use the epilogue from the second edition. For the record I did persevere with this book and found it to contain some worthwhile ideas though also reflecting some of the weaknesses in this strand of 'autonomous marxism'. I posted some other comments in relation to this on 'The Free Association' discussion thread. Just noticed the linked article by Louis Proyect. Not sure what AJI thinks of this as an ex-SLPer since it seems to rightly criticise Holloway's and other autonomist and anarchist fetishizing of Marcos and the Zapatistas, but largely on the basis of an equal fetishising of 'the Cuban revolution' and what the author seems to identify as a strategy based on the 'successes' of other 'third world socialist revolutions' rather than a recognition of their state capitalist nature. I think you're right. The cult of personality around De Leon is one of the reasons why I ended up resigning from the Party back in the year. I think it's just important to not get caught in that trap no matter what your perspective is. That's some pretty sophisticated spam there, references another book by JH and it's content. Damn, Skynet is farther away than I hoped. We had to read his Crack Capitalism book for my political science class and I must say I was surprised that I actually enjoyed it.